This interesting name found in the spellings of Holm, Holme, Home, Homes, Holmes, and Holms, is of either Norse-Viking or Olde English pre 7th century origins. It is both locational and topgraphical, the derivation being from residence at a 'holm' or from one of the places named Holm(e), found in the most counties of the East Anglian region, and more sparingly in other counties as well. The village names recorded in the 1086 Domesday Book appear as Hougan, Holun, Holm, Olm, and Holna, so much for early spellings. Most of the placenames have the same meaning of an area of dry land in a fen, or perhaps a piece of land partially surrounded by water. It is generally agreed that in East Anglia the derivation is from the Norse-Viking 'holmr' which means an island, those from further afield may derive from the Olde English "holegn", meaning holly woods, or 'holm' meaning the 'holm oak', which in Saxon times was often the local meeting point of the area, or even 'haugum', a rare Norse word for a hill. 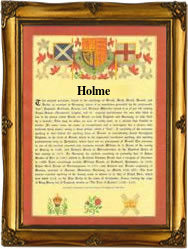 This would apply in the case of 'Holme on the Wolds' in the East Riding of Yorkshire. Early examples of the name recording include Urkell de Holmes, in the Assize Court Rolls of Yorkshire in 1219, and John atte Holme in the 1296 Subsidy Rolls of Sussex. Later examples are those of William del Holmes of Derbyshire in 1327, and Robert del Holme in the 1379 Poll Tax Rolls of Yorkshire. On February 10th 1548, Anne Holmes married Alexander Foster at St. Pancras Church, London, whilst in 1574 Robert Cooke obtained a license to marry Johanna Home of Isleworth. The coat of arms granted in 1568 has a black field, a silver lion rampant, charged with three red bendlets. The first recorded spelling of the family name is shown to be that of Roger de Holm, which was dated 1186, in the "Seals Records of Leicestershire", during the reign of King Henry 11, known as "The Builder of Churches", 1154 - 1189. Surnames became necessary when governments introduced personal taxation. In England this was known as Poll Tax. Throughout the centuries, surnames in every country have continued to "develop" often leading to astonishing variants of the original spelling.